From bayous covered in Spanish moss to the rugged foothills of the Appalachian Mountains, the American South presents a legend-haunted landscape replete with many ghosts, ghouls, and monstrosities. Like the rest of America, the South is a repository of European, African, and Latin American folktales, all of which have been given a Southern flavor over the generations. Currently, the South is a hotbed of paranormal activity and supernatural sightings. 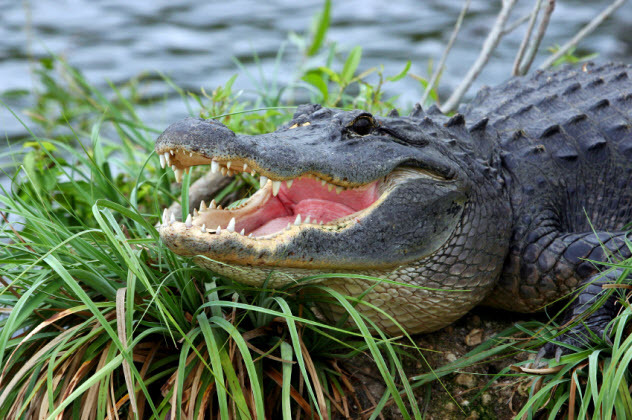 By the time that University of Alabama professor Carl Carmer set down the legend of Two-Toed Tom in his book Stars Fell on Alabama, the creature was described as a “red-eyed hell-demon” that took the form of a 4-meter-long (14 ft) alligator. Although many locals on the Florida-Alabama line may claim that the legend is ancient, most accounts of Two-Toed Tom started circulating in the 1920s. Principally located in the town of Florala, Alabama, Two-Toed Tom is reportedly a great carnivore who likes to feast on livestock. Furthermore, it’s believed that Two-Toed Tom earned his moniker after getting his foot caught in a trap, thereby severing two toes on his left foot. The most widely repeated account concerning Two-Toed Tom concerns his battle with a farmer by the name of Pap Haines. After finding one of his mules grotesquely mauled, Haines and his sons filled 15 syrup buckets with dynamite and tossed them all into a pond where they believed that Two-Toed Tom was digesting his latest meal. Tragically, all the dynamite did was drive Two-Toed Tom out of the water. Once on land, the creature snatched Haines’s 12-year-old granddaughter and killed her. A distraught Haines vowed vengeance, but he failed to kill the beast. As such, a common rumor is that Two-Toed Tom is impervious to bullets. While many debate whether or not West Virginia is a Southern state, the fact that a majority of the state lies below the Mason-Dixon Line qualifies it for this list. The Mountain State has its fair share of monsters and monster hunters. The Grafton Monster is just one such example. Located in the north-central region of West Virginia, Grafton is best known as the birthplace of Mother’s Day and was once a prosperous railroad town. Nowadays, Grafton is better known for its pepperoni rolls (a West Virginia delicacy native to the north-central region) and its monster. According to the first eyewitness accounts that emerged in the 1960s, the Grafton Monster is said to resemble Bigfoot, stand between 2–3 meters (7–9 ft) tall, and have slick, seallike skin. Like Sheepsquatch, another West Virginia monster, the Grafton Monster is said to be very pale. One of the first people to see the monster was Robert Cockrell, a reporter for the Grafton Sentinel, who claimed to have seen the monster while driving on the night of June 16, 1964. Cockrell’s sighting, which begat a series of articles in the Grafton Sentinel, set off a craze for the beast in Grafton, thus ensuring a spot for the creature in West Virginia folklore. Stories about North Carolina’s Moon-Eyed People can be traced back to the region’s native Cherokee people. Long the inhabitants of the Southern Appalachians, the Cherokee used to speak of the Moon-Eyed People as a separate race of squat, bearded, and perfectly pale tribesmen. Unlike the Cherokee or the Creek (the latter tribe being a noted enemy of the Moon-Eyed People), the Moon-Eyed People built stone forts, some of which can still be found all across rural North Carolina, Georgia, and Tennessee. The Moon-Eyed People are also said to be a nocturnal race who prefer to live underground in the eternal darkness. As the legend goes, the Moon-Eyed People were driven underground by the Creek (some sources say the Cherokee) after losing a protracted war. Driven from their headquarters in Hiwassee, which is today near the town of Murphy, North Carolina, the Moon-Eyed People went north into the mountains during a full Moon and began living like ghosts. The legend of the Moon-Eyed People is similar to the Cherokee tales of the Yunwi Tsudi and the Nunnehi, both of whom have been described as phantom races. However, the fact that the Moon-Eyed People appear to be human has led to speculation concerning their origins. Many believe that the Moon-Eyed People are an ancestral memory about early Cherokee contact with pre-Columbian European settlers. In particular, many point to the Welsh legend of Prince Madoc, a medieval figure who supposedly navigated the Ohio River in the 12th century, as the source of the Moon-Eyed People. Considering that so many of Appalachia’s inhabitants can trace their origins to the British Isles, specifically Wales, the Scottish borders, and the Protestant settlements of Northern Ireland, it’s not surprising that certain Appalachian legends are echoes of older British ones. In the case of the Demon Dog of Valle Crucis, the influence of Great Britain’s many “black dogs” is unmistakable. Valle Crucis (“Valley of the Cross”) is a small town in the hills of western North Carolina. The name stems from the fact that two rivers meet at right angles in the middle of a nearby valley. Does the crossroads-like configuration have something to do with the village’s demon dog? Maybe. Either way, according to local superstition, a spectral hound haunts an old stone church not far from Highway 194. According to eyewitnesses, the Demon Dog is aggressive and is not shy about chasing unsuspecting citizens away from its domain. Before earning its sinister nickname, the Devil’s School in Jacksonville, Florida, was officially called Duval County’s Public School No. 4. A weathered, brown-brick structure not far from Interstate 10, the Devil’s School earned its haunted reputation in the 1960s when a furnace explosion in the basement killed several students, teachers, and the school’s lone janitor. As with most legend-tripping spots, this story about a furnace explosion causing a massacre is not true. During the 1980s, the abandoned school became a hotspot for teenagers interested in scaring each other. Other variations of the massacre legend accused a cannibal principal or a sociopathic janitor for the school’s gutting. No matter which version of the story is told, the Devil’s School is reputed to be a hub of satanic activity. Paranormal investigators who have explored the dilapidated and abandoned school claim that, along with all of the satanic graffiti, the school sports its fair share of ghosts. As the story goes, the Haunted Pillar in Augusta, Georgia, once belonged to a thriving city market. One day, a firebrand preacher decided to spread the Good Word while standing beside the pillar. The local authorities had other ideas, however. Before being physically removed from his unusual soapbox, the preacher cursed the town and said that his pillar would soon be the only thing left standing in all of Augusta. A freak tornado brought this curse to life by leveling the entire town. The only thing untouched was the pillar. As if this weren’t bad enough, it is claimed that whoever tries to move the pillar is doomed to die. Interestingly, today’s pillar only dates back to the 1930s because the original marker was knocked down during an automobile accident in 1935. Local businessmen, who probably saw the value in keeping such an urban legend going, quickly rebuilt the pillar on the corner of 5th and Broad Streets. East Tennessee’s Skinned Tom is also known by the less frightening name Old Tom. Like real-life serial killers, Skinned Tom is said to haunt isolated lovers’ lanes. When he catches couples necking in parked cars, Skinned Tom approaches their vehicles very quietly. Initially, the intruder appears to be normal. But once Skinned Tom gets close, his victims notice that he is a skinless monstrosity whose organs still beat and pulse as if alive. The most common story about Skinned Tom is that he was once a dashing rogue who had a habit of cuckolding married men. That all changed when an enraged husband caught the backwoods Casanova one night in a lovers’ lane. Rather than kill Tom outright, the husband decided to skin Tom alive. This horrible death left Skinned Tom with a deep hatred of women. Some stories say that Skinned Tom cannot rest until he finds the woman who watched him die, while others simply claim that Skinned Tom, who tends to carry a knife, is simply dedicated to eradicating lovers’ lanes near the Tennessee town of Rogersville. On the Natchez Trace Parkway, there sits an unusual sign. 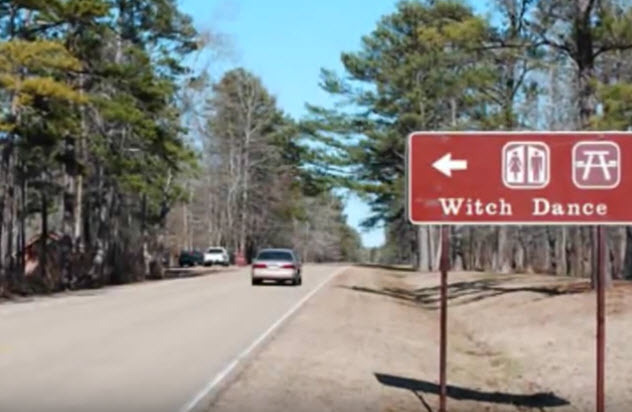 Located in a campground just south of Tupelo, Mississippi, the “Witch Dance” sign claims that witches with black capes and brooms once used the forest to ritually communicate with demons. Furthermore, when the witches danced during the early morning hours, their feet would occasionally touch the ground. This is the reason given for the campground’s many scorch marks. The idea of a witch-haunted Natchez Trace (today’s Tombigbee National Forest) has been around since at least the days of Andrew Jackson. Even the president himself made a journal entry about how Micajah “Big” Harpe—a backwoods serial killer who had terrorized the inhabitants of Kentucky and Tennessee with his brother during the American Revolution—had tempted the witches by jumping from scorch mark to scorch mark. Another legend connected to Natchez Trace claims that the area was haunted long before Hernando de Soto explored the Mississippi River in 1541. According to this belief, the area’s Chickasaw and Choctaw tribes avoided the area entirely because they saw the scorch marks as signs of cursed land. Like West Virginia, many people do not consider Maryland a Southern state. Also like West Virginia, Maryland lies below the Mason-Dixon Line, thereby earning it a place on this list. Kingsville, Maryland, which shares the same county as Baltimore, is a tiny town of about 4,000 people. Its only claim to fame is the spooky Hoodoo Marker that currently sits just off US Route 1. Like the better-known religion of voodoo, hoodoo is a type of folk magic that is predominately performed by African Americans. Unlike voodoo, which borrows heavily from Roman Catholicism, hoodoo is a more scattered, less hierarchical religion that has taken some pointers from Protestant Christianity, especially Baptist and Pentecostal practices. Interestingly, the Hoodoo Marker does not have anything to do with hoodoo. The stone pillar is nothing but a former property marker owned by a man named Edward Day. Angered by a court’s decision to favor his neighbor Thomas Todd in a property dispute, Day inscribed a curse on his marker that damns anyone who seeks to move the stone. Needless to say, the stone has not been uprooted, shifted, or relocated in over 200 years. In terms of myth and legends, no American state can touch Louisiana. The national home of voodoo, black magic, and other kinds of spooky workings, the Pelican State is a rich source of Southern folklore. One tale may or may not involve the Devil himself. Prior to the Devil Man’s arrival in New Orleans, the unknown Axeman had terrorized the city. A serial killer who mostly preyed on the city’s Italian population, the Axeman managed to enter homes unannounced by chiseling out panels in solid, wooden doors. 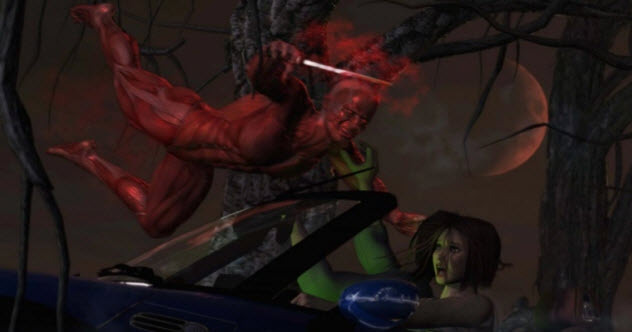 While many investigators believe that the Axeman did this as a diversion, his trademark convinced many New Orleans residents that the killer was some kind of supernatural entity. A March 1919 letter reportedly written by the killer further strengthened this suspicion. In the letter, which was published by the New Orleans Times-Picayune, the Axeman claimed that he was nothing less than an actual demon. Twenty years later in September 1938, eyewitnesses claimed that the Algiers section of New Orleans was plagued by another demon. Called the Devil Man, this monster was described as having large pink ears, chicken eyes, and long black horns. For the most part, the Devil Man rode through the night sky, trashed bars, and made rude comments to women. In other instances, the Devil Man turned himself into a baboon in order to allude capture. Benjamin Welton is a freelance writer based in Boston. His work has appeared in The Weekly Standard, The Atlantic, Listverse, Metal Injection, and other publications. He currently blogs at http://www.literarytrebuchet.blogspot.com.